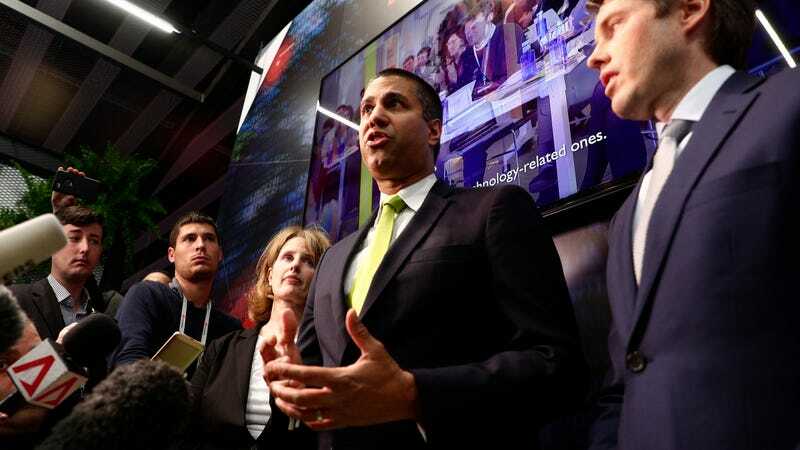 FCC Chairman Ajit Pai, center, attends a press conference at the Mobile World Congress wireless show, in Barcelona, Spain, on Feb. 26, 2019. $208.4 million is a lot of hypothetical money. But unfortunately, the paper also reports that records show the agency has managed to collect less than $7,000. Put differently, the FCC has only managed to collect 0.003 percent of the fines it’s imposed in the last three-to-four years. One reason might be that the individuals and organizations being fined don’t have $200 million laying around. But if that were the case, other regulators targeting robocalls would be experiencing similar troubles. That doesn’t appear to be the case. The fault here doesn’t rest entirely on the FCC’s shoulders. The agency relies on the Justice Department to actually collect the money, as it has no authority to do so on its own. The DOJ is clearly dropping the ball. The Great American Scourge—as I prefer to call it—is steadily intensifying, with U.S. residents experiencing no less than a 46 percent increase in robocalls in 2018 alone. The FCC itself cited a study recently that estimates roughly half of all calls made to cellphones in the U.S. this year will be spam. Globally, robocalls grew 325 percent last year. There is plenty of blame to go around, sure. But until the government takes some concrete steps to end the scourge, one thing seems obvious: The FCC chairman should, at the very least, refrain from bragging about his agency’s meaningless robocall fines on TV.